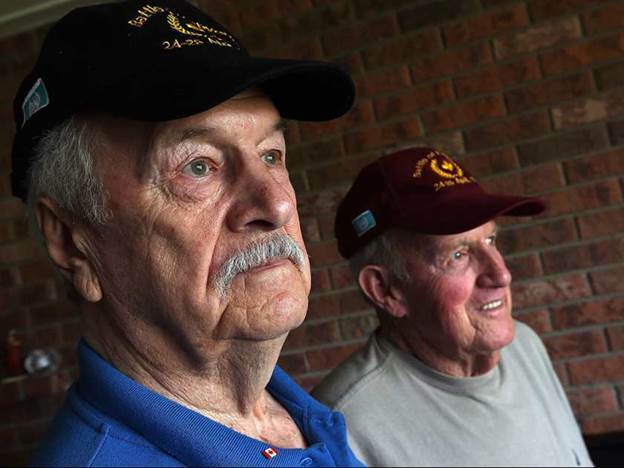 Henry Martinak (left) with his lifelong friend and fellow Kapyong Veteran Bernard Cote, in photograph taken shortly before they departed for Korea to commemorate the 65th anniversary of the battle in April this year. No matter how many years a Korean War Veteran has seen, his passing always is a tragedy to family and friends. In the case of Canadian Veterans Henry Martinak it is also a tragedy to the Korea Veterans Association of Canada, the Canadian Pensioners Association and other veterans-oriented philanthropic groups he belonged to. It is also a tragedy to his city of Windsor, where his mark was made during the years, and in Busan, Korea, where the Monument to Canadian Fallen he raised funds for within Canada and the United States, has stood since its dedication and consecration on November 11, 2001. His hand in the formation of that monument also is seen in Canada’s capital of Ottawa, where a Canadian version of the Monument to Canadian Fallen is located. Canadian Veterans and the Korean Ambassador and visiting dignitaries from Korea hold services at that monument on many occasions throughout each year. On Sunday, December 4, 2016, Mr. Martinak spent the day in a suburb of Detroit, Michigan, taking part as a special guest at a U.S. Korean War Veterans event. His lifelong friend, Bernard Cote from Windsor was at his side throughout the day. Martinak (right, seated) with his friend Bernard Cote and Canadian Defence Attache Jeff Drummond in the United Nations Peace Memorial Hall in Busan in April, 2016. Mr. Martinak is seated, as he suffered an accidental fall during the week-long activities. Note the U.S. Presidential Citation both of them wear above their medals. Mr. Martinak also wears the Queen Elizabeth Golden Jubilee Medal and the Queen Elizabeth Diamond Jubilee Medals, as well as the Veterans Affairs Canada Commendation badge. Shortly after they returned to Windsor, Mr. Cote received a phone call from another veteran, their close friend Dave Parent, who had been with them at the veterans event. The message was startling, virtually unbelievable. Mr. Martinak died in his residence shortly after returning from the outing. Though youthful in spirit and always outgoing and exuberant, he was 89 years old. Mr. Martinak and Mr. Cote had known each other long before the Korean War. They both enlisted in the Canadian Army Special Force on August 16, 1950, during the first week in which it was possible to enlist for Korean War service. They have consecutive service numbers. They remained constant companions, both serving in Korea with the 2nd Battalion of the Princess Patricia’s Canadian Light Infantry Regiment. Both were veterans of the April, 1951 Battle of Kapyong and both wear the U.S. Presidential Unit Citation that was awarded to their battalion for its heroic service during that battle. A rambunctious, handsome young man, Mr. Martinak reenlisted and served in the Canadian Army after his first special force enlistment was up, serving in total from June, 1950 through 1957. Mr. Martinak later became president of the Fitters and Machinists Union in Windsor and held that post for many years and was well known and highly regarded for his union leadership skills. He was the treasurer of the Windsor Unit of the Korea Veterans Association of Canada, President of the Canadian War Pensioners Association Rose City Branch, a member of the Royal Canadian Legion and of the Princess Patricia’s Canadian Light Infantry Association. He was awarded the Veterans Affairs Minister’s Commendation for his years of work supporting veteran activities. In addition to raising funds to help pay for the Monuments to Canadian Fallen, for which Bernard Cote was by far the single largest donor, Mr. Martinak founded and led the Windsor-Essex Korean War Memorial Foundation. Under his leadership and supervision, the organization had a fine monument designed and constructed in Dieppe Park, in Windsor, along the riverfront that faces Detroit, Michigan. It is one of the finest Korean War monuments in all of Canada. As president of the war pensioners unit in Windsor, he spearheaded fund raising to support the veteran’s wing of Parkwood Hospital in London, Ontario. Mr. Martinak, Mr. Cote, Mr. Parent and others drove there many times to donate funds, and to participate in uplifting activities for the veterans confined there. Under Mr. Martinak’s leadership the pensioner’s unit donated many beds, wheelchairs and other service aids to the veterans in long-term care. He was a very strong advocate for Korean War Veterans in his home community, often meeting with, and sometimes clashing with the Windsor City Council and Mayor, demanding rights and recognition for his comrades and their needs and causes. He was not an easy man to not listen to. Mr. Martinak returned to Canada from the war in the late autumn of 1951, but his heart and much of his spirit always longed for Korea. He returned there on eight different occasions, both while fund raising for the Monuments to Canadian Fallen, and on various veteran visits supported by the Ministry of Patriots and Veterans Affairs. He had been asked to represent all Canadian Veterans when Ban Ki-Moon, Secretary General of the United Nations, made an official visit to the United Nations Memorial Cemetery in Busan, and on the day of his visit prayed at the grave of a Canadian soldier who had fallen on that day 50 years previously. Mr. Martinak had made arrangements to travel to Korea, but ill health caused him to cancel the trip on a last minute basis. However, Mr. Martinak did journey to Korea for the 60th anniversary of the Battle of Kapyong in that same year. 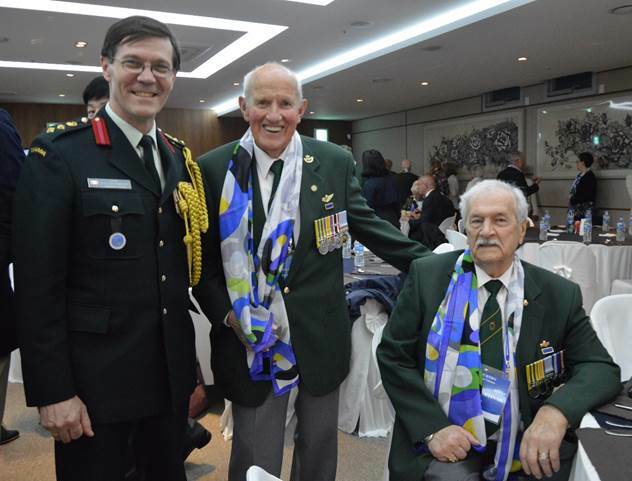 This past April, Mr. Martinak and his longtime friend Bernard Cote both traveled to Korea to participate in ceremonies marking the 65th anniversary of the Battle of Kapyong. On his last day, Mr. Martinak was exhuberant, and jovial, and a leader among men, until he took his last breath in his own home. The ranks of such men are getting fewer and fewer, year by year and month by month. He was one of those who seemed he would always be marching and working alongside his comrades, and leading the charge wherever need be. One wonders if there are others worthy to stand in his shoes and serve their country and their fellow men with the faith and conviction and outright bravery that was the watchword for this good man’s life.